Please join us for a performance and screening of Objects in Mirror Might Be Closer Than They Appear, a collaboration between Julius von Bismarck and Julian Charrière. The film was shot in the Exclusion Zone, an area stretching 30 kilometers in all directions centered on the Chernobyl Nuclear Power Plant, whose explosion in 1986 rendered the land uninhabitable. The series is an excursion into the “involuntary park” which this region has become – a glimpse into a non-human space overrun by wildlife and forest as seen through the perspective of a living deer, made possible by mounting a camera onto its antlers and directed towards its eye. What is then seen is the reflection of the landscape onto the animal’s retina: a mixture of an invisibly decaying but thriving natural ecosystem and the ruins left by the humans that once dominated this space, rejected infrastructures of a forgotten nuclear past. 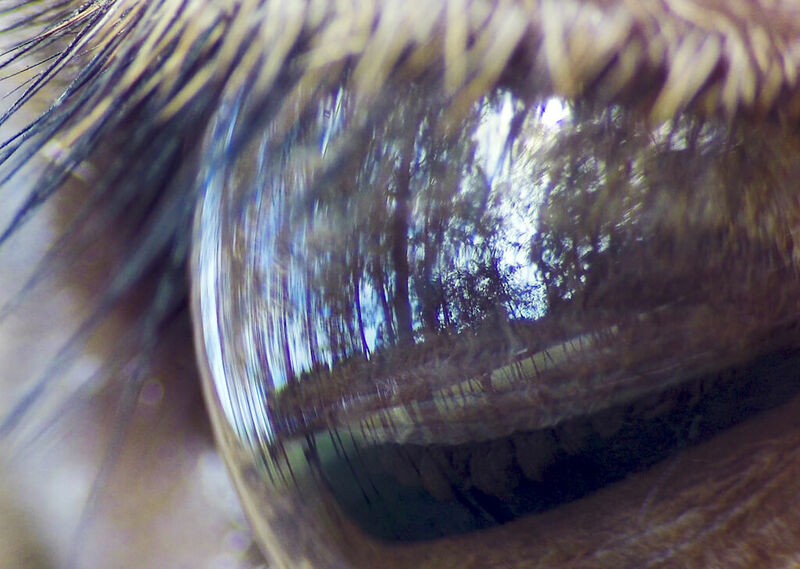 The deformed image, a direct product of the curvature of the animal’s ocular perception system, serves as a metaphor for an altered present, a transformed environment in which these animals now live. These images dialogue within the piece with found footage of the first mission to outer space: the subjectivity of the astronaut looking at the earth from above directly responds to the subjective perspective of the deer itself. The screening will be accompanied by readings of a selection from Jules Verne’s 1865 novel, De la terre à la lune, which will be simultaneously translated by a chain of interpreters into multiple languages, providing the audience with a chorus of entangled language. Julian Charrière is a French-Swiss artist based in Berlin, Germany, whose work bridges the realms of environmental science and cultural history. A former student of Olafur Eliasson and participant of the Institut für Raumexperimente (Institute for Spatial Experiments), Charriére has exhibited his work – both individually and as a part of the Berlin-based art collective Das Numen – at museums and institutions worldwide, including at the Parasol Unit Foundation for Art in London; Musée des Beaux-Arts de Lausanne in Switzerland; Centre Culturel Suisse in Paris; Haus der Kulturen der Welt in Berlin; Kunsthalle Wien in Vienna; Thyssen Bornemizsa Art Contemporary in Vienna; Neue Nationalgalerie in Berlin; The Reykjavik Art Museum in Iceland; the Museum of Contemporary Art in Tokyo; The Kochi-Muziris Biennale in India; and at the the 12th Biennale de Lyon in France. In 2017, Charrière was featured in the 57th International Art Exhibition – La Biennale di Venezia, titled VIVA ARTE VIVA, and in 2012, Charrière collaborated with Julius von Bismarck on the site-specific performance piece Some Pigeons Are More Equal Than Others for the 13th International Architecture Exhibition – La Biennale di Venezia. Charrière was awarded the Kiefer Hablitzel Award / Swiss Art Award in both 2013 and 2015. Julius von Bismarck grew up in Riyadh, Saudi Arabia and Berlin, Germany, where he lives and works. Among his solo exhibitions are: I Like The Flowers, Kunstverein Frankfurt, Frankfurt (2017); Objects in mirror might be closer than they appear (with Julian Charrière), Villa Bernasconi, Grand-Lancy (2016); Tiere sind dumm und Planzen noch viel dümmer, Kunstverein Göttingen, Göttingen (2015) and History of Apparatus, Kunstverein Arnsberg, Arnsberg (2014). Among his group shows are: PRODUKTION. made in germany drei, Sprengel Museum, Hannover (2017); The 1st Antarctic Biennale, Antartica (2017); Deep Inside, 5th Moscow International Biennale for Young Art, Moscow (2016); Kunstpreis der Böttcherstraße, Kunsthalle Bremen, Bremen (2016); Under Arms. Fire & Forget 2, Museum für Angewandte Kunst, Frankfurt am Main (2016); Welcome to the Jungle, KW Institute for Contemporary Art, Berlin (2015); and Fire and Forget, KW Institute for Contemporary Art, Berlin (2015). In 2017, von Bismarck received the Art Prize of the City of Wolfsburg.